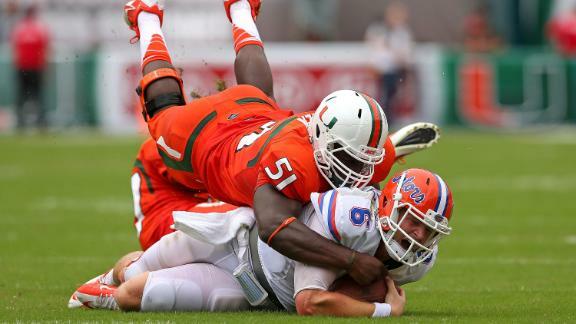 After countless losses in big games over the last few seasons the University of Miami scored its 1st signature win for the first time in a long time with a 21-16 win over rival #12 ranked Florida Gators. The win caught many people by surprise but Miami earned today's victory. Despite the Gators earning 413 yards to Miami's 212 yards the canes still managed to pick up the win to move to 2-0 on the season. The defense a huge factor in the win today for Miami, forcing 5 turnovers and putting pressure on gator QB Jeff Driskell all day long. Led by linebacker Denzel Perryman they forced 3 fumbles and intercepted all day playing with UM swagger that so many have been waiting to see for years. What was once a weakness for the Canes is now a strength that ultimately led them to pick up a signature win over the Gators. As great as the defense was the offense was really inefficient. Had the defense not played up to its potential the result of this game would have been different. They put themselves in way to many 3rd and long situations and going 1-11 on 3rd down conversions was a result of that. Duke Johnson averaged less than 3 yards per carry today and could not establish any type of run game today. As great as the win is for the program lots of things must be straightened out moving forward. 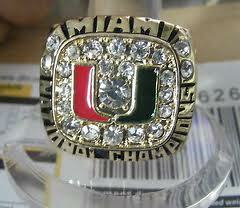 So with the big win over Florida the question of “Is Miami Back”? Will certainly be asked and to answer it I would have to say its a step in the right direction but this program has along way to go if they want to be considered “back”. This program is about National Championships and until “The U” can prove that they can compete consistently for elite status in College Football they won't officially be back.